Imagine if you lost 50% of the value of your investments overnight. How would you feel? Undoubtedly upset, concerned, and disillusioned over the stock markets. While most people assume this scenario is unlikely, the truth is this value slashing happens every day without you even realizing it. In fact, it happens every time you buy a stock or bond for the long-term. You are charged a huge hidden cost and don’t even know it. Virtually every public company starts as a private company. When the company goes public (IPO), the stock price usually increases significantly. This higher price for the exact same company is called an auction liquidity premium. The public pays a higher price for the same asset because you also gain the ability to sell the shares you just bought. The price now includes a markup for daily liquidity, which an investor pays for whether or not they use it. In a report for NYU’s Stern School of Business entitled “Private Company Valuations”, finance professor Dr. Aswath Damodaran posits that “the illiquidity discount for a private firm is between 20-30%”, i.e. a normal investor will pay 20-30% more for the same product because he or she is buying in the public market versus the private market. While one could debate the fairness of such a large premium, if you are a buy-and-hold investor whose intention is to invest for the long-term (as almost all investment advisors recommend), it seems not only unfair but flat-out foolish to pay 20-30% more for a “daily liquidity premium” that you don’t intend to use. Earlier this year, Invitation Homes (stock ticker “INVH”), a Blackstone-owned portfolio of single family rental homes, filed its initial public offering on the NYSE. The price of a share in the IPO was $20—a 215% increase from the $6.36 per share book value it had disclosed only two months prior to its IPO. In other words, in a span of only two months, the value of Invitation Homes grew by roughly 215%. What happened to cause such astronomical growth in the value of the company? Invitation Homes is a company that buys what they believe to be undervalued suburban homes across the U.S. and then spends money renovating those homes and renting them out. According to the company’s public offering prospectus, both revenue and operating expenses were fairly consistent over the months prior to going public. Put simply, there was really no material change in the underlying business between December 2016 and February 2017—and certainly nothing that would warrant a 215% increase in the value of the company. So, if nothing changed, what did happen? Behold the public market price markup. Diversify your portfolio into the private market with Fundrise. Get started with $500. The truth is that nothing material about the core Invitation Homes business changed. What did change is that the company went from being owned primarily by Blackstone and their investors in the private market to being owned largely by individual investors in the public markets. The 215% increase in value translated to $4.3 billion in additional enterprise value being captured by the pre-existing, private owners of the company as a result of “going public”. Put another way, this 215% one-time markup is the premium paid by the public market investor for access to the same investment opportunity that the private market investor had. Why does the public market investor end up paying such a high premium for the same thing? The conventional argument is that the public market investor is paying for access to daily liquidity. In other words, the public markets afford the ability to sell an investment at any time, which therefore warrants a lower return for the same asset via a “liquidity premium”. Just how big of an impact does the 20-30% public market markup have on the average investor’s returns? Returning to the example of Invitation Homes, while privately-owned at $6.36 per share book value, investors earned approximately 8.75% annualized current income. At the IPO, the average investor paid $20 per share and, as a result, returns fell to 2.8% annualized current return. 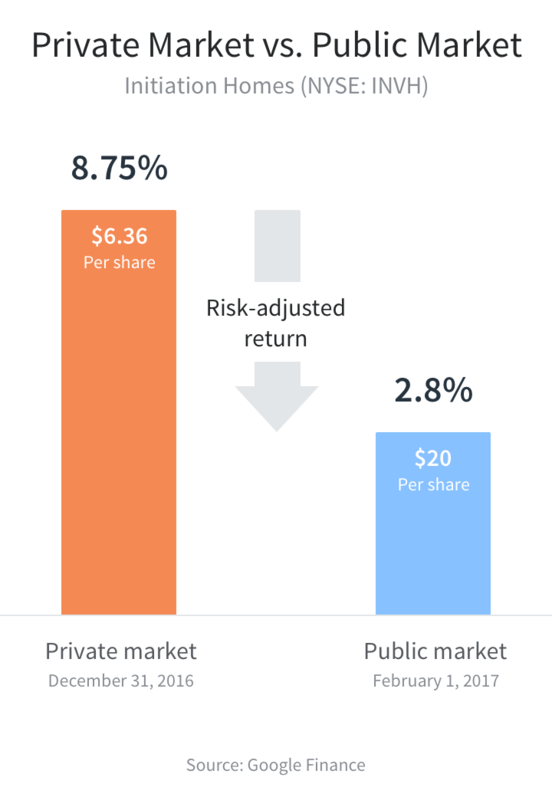 Industry-wide, the public versus private market divide results in the average investor paying more for shares that will earn less than those held by the private market investor—regardless of whether they are consciously making the tradeoff of lower returns for other (real or perceived) benefits. For the first time, Fundrise creates an opportunity for individual investors to have that choice, leveling the playing field when it comes to the private markets. Online distribution combined with software-driven asset management reduces friction, lowers transaction costs, and allows for the disintermediation of unnecessary middlemen. What was previously only attainable by a private investor with the right relationships and deep pockets can now be purchased online by any investor through a financial technology platform. Private market investing for the public investor has the potential to not only revolutionize the real estate capital markets, but the broader financial markets as well, by democratizing access to a more sophisticated investment portfolio with higher return potential. When evaluating investment opportunities for yourself, understanding the underwriting that has been performed is critical. The quality of the underwriting performed can be an important indicator of the quality of the investment itself. Virtually every major institutional investor holds on average 25% of their portfolio in private alternatives. These private investments, however, have been largely inaccessible to the average investor - until now.